20 Mule Team Peak is located in the Black Mountains of Death Valley National Park, not far from Furnace Creek. Access is via the Twenty Mule Team Canyon scenic drive. The drive and the hike go through some really interesting, colorful, and funky bandland terrain. After driving from Boise to Death Valley, I was looking for a short but scenic hike. 20 Mule Team Peak definitely fit the bill. Following guidance from Bob Burd’s trip report, I parked on the side of the road near the highpoint of the scenic drive, and started hiking southeast across a flattish open wash area. I could see the highpoint above me, but the best way to reach it wasn’t obvious. I followed the wash for a while, then up on a rib that had seen foot traffic. From there I was able to see a route up another tighter wash that would lead to a saddle northeast of the peak. The hiking was really interesting, especially winding my way up the tighter wash to the saddle. From the saddle, I carefully made my way up the steeper sandy slopes while looking for solid footing. Soon enough I made it the summit, where I was greeted by great views and a blast of wind. I briefly debated a traverse to “Artists Palette Peak” to the west, but I couldn’t spot a good route. Instead, I decided to descend a different ridge to the east on the way down to see some more interesting terrain. After noticing the sun was starting to get low in the sky, I decided to stop gawking at the scenery and pick up the pace back to the car so I’d have time for a quick hike up nearby Red Cathedral. Round trip for 20 Mule Team Peak was just under 3 miles, 1200’ gain, in 90 minutes. 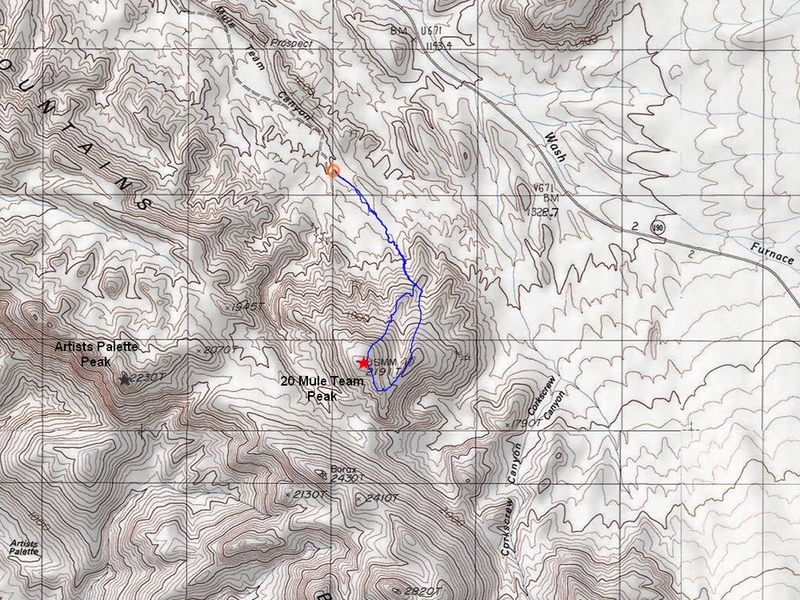 Map of the route, just under 3 miles and 2200' gain round trip. We went clockwise. Early view of 20 Mule Team Peak. I followed the leftmost wash to the saddle on the left. Winding up the tight wash.
20 Mule Team Peak from the saddle. View south from the summit, Borax Benchmark. Looking back on the summit from the southeast. Heading back down to the car. Map of the route, just under 3 miles and 2200' gain round trip. We went clockwise.Early view of 20 Mule Team Peak.Funky badlands.I followed the leftmost wash to the saddle on the left.Winding up the tight wash.20 Mule Team Peak from the saddle.View south from the summit, Borax Benchmark.Me on the summit.Looking back on the summit from the southeast.Heading back down to the car.